The most common form of Marek’s disease is the lymphoproliferative syndrome, wherein mononuclear infiltrates develop in peripheral nerves and organs. The clinical signs associated with this condition are non-specific and relate to the location of the lesions. A variety of neurologic signs can develop including spastic paralysis of the limbs, exhibited here. 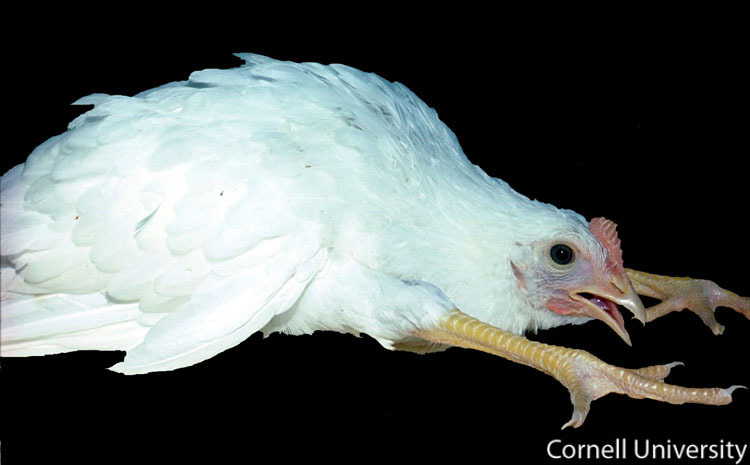 This chicken is also gasping, a sign associated with the paralysis of the respiratory and digestive systems.